Get a Driver Helpful DOT Physical Exam in our Friendly Office located in East Greenbush, New York near Troy, New York! Pass Your CDL Physical Exam! Dr. Bhoiwala knows how important it is that you continue your livelihood as a commercial driver. With his extensive knowledge of the DOT Physical Exam medical guidelines, Dr. Bhoiwala will steer you through the DOT Physical Exam requirements so you can Keep on Truckin’. Looking for a DOT Physical Exam or CDL Physical Exam in East Greenbush, New York near Troy, New York? You’ve come to the right place! Serving The Troy, New York Area! Located inside Hannaford Plaza in East Greenbush, NY at the junction of Route 4 and Columbia Turnpike (Routes 9 & 20). We are found behind Subway. 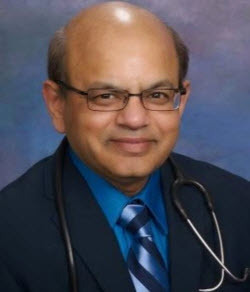 Laxmikant Vithaldas Bhoiwala, MD is a General Internal Medicine Physician and a National Registry Certified Medical Examiner helping drivers maintain their livelihood thru his knowledge of the Medical Standards and Guidelines. He is highly experienced, proudly serving East Greenbush, NY and surrounding capital district. He has over 25 years of experience in a wide array of clinical settings. He completed his training at Advocate Christ Medical Center in Illinois. His area of expertise is urgent and primary care. Under the umbrella of urgent care he is able to take care of many acute care needs such non-life threatening emergencies, minor injuries, and minor surgical issues. Preventative care is very central to his expertise. Dr. Bhoiwala manages chronic diseases such as diabetes, hypo or hyperthyroidism, high blood pressure, and cholesterol. His in-depth and up to date knowledge in weight management and nutrition offers patients a comprehensive approach to their care with Dr. Bhoiwala. He believes that a key to good health is to work hand in hand with your doctor on the management of your health issues. His approach to medicine is very open minded which lends to a very personalized medicine. He welcomes questions and discussions on disease and therapy.